Memorial Day is just around the corner, and the unofficial start of summer brings weekends of camping, days of pool lounging, and beach-bound road trips. And what summer is complete without a bonfire and some s'mores? But you know the problem with s'mores? You get the marshmallow all nice and hot and melty, but the chocolate just sits there, and the heat from the marshmallow is rarely enough to melt the chocolate, giving you subpar s'mores. So how do we fix the problem? 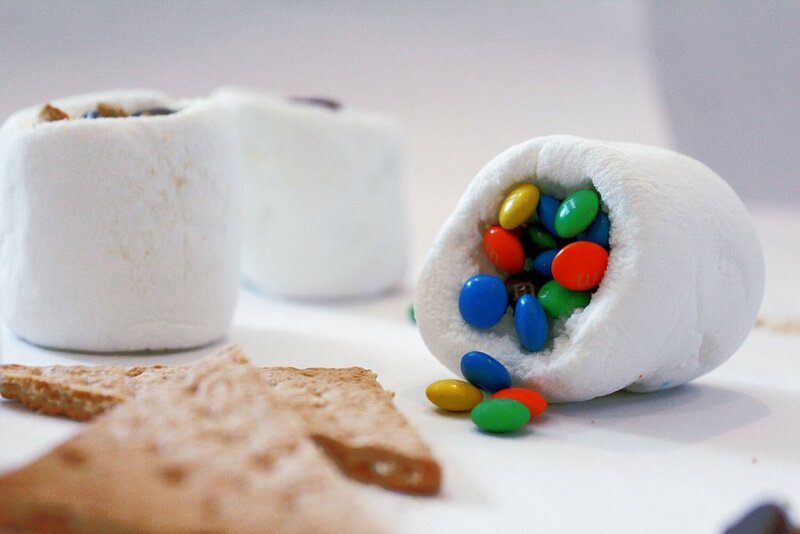 We stuff the chocolate in the 'mallow, allowing you to get everything all melty, just the way a s'more should be. Hollow out those jumbo marshmallows. I started out using the handle of a wooden spoon, but that got real sticky real fast, so I ended up just using my freshly washed fingers. This made it easier to feel how far I could push the marshmallow out without poking through them. Fill them with the sweets of your choice. Take some marshmallows (that haven't been filled yet), and microwave them no longer than 30 seconds. Stir up the marshmallows and fill a piping bag with the gooey goodness. Now comes the time to work fast! The melted marshmallows don't stay that way for long. Pipe the melted marshmallow mixture in a spiral over your filling, making sure you completely seal the marshmallow closed. Allow the mixture to set, then toast them up and enjoy! Will you be roasting marshmallows this memorial day weekend? You definitely cannot go wrong with adding Nutella, hot fudge, and hot caramel--those were the office faves! The way it just oozes out when you take that first bite. But there's so many more candies to try! I'd love to hear what filling combos you come up with!